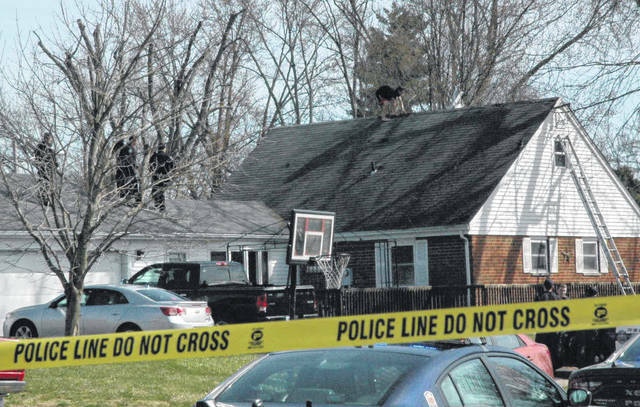 Scott Halasz | Greene County News Xenia police wait as a man crawls around a roof on Chinook Court Monday afternoon. The man was up there for several hours and refused to come down. He finally jumped down and fled before being apprehended by police. XENIA — A man was taken into custody and then to the hospital for mental evaluation after climbing to the roof of a Xenia home and refusing to come down. Xenia police officers were dispatched to the 1600 block Chinook Court around 2:30 p.m. on a call of a person acting erratically. The person was destroying property in a residence and eventually climbed out a second floor window and got onto the roof, police posted on Facebook. While on the roof he was seen damaging shingles and vents as police tried to get the man to give himself up. After several hours, a cluster of officers who were standing on a shorter portion of the roof offered the man a lighter for a cigarette, according to WDTN. He began to edge toward police, and when he got within arm’s reach, the officers lunged at him and the man took off, ultimately jumping down from the roof and running from officers. He was caught by police and taken to Greene Memorial Hospital for a mental evaluation. He also suffered some superficial cuts, according to Sgt. Scott Beegle. No weapons were immediately found at the scene. He could face charges of inducing panic, but official charges will come from the Greene County Prosecutor’s Office, according to police. His identity had not been released as of press time. https://www.xeniagazette.com/wp-content/uploads/sites/32/2019/04/web1_DSC_6660_ne20194121055974-1.jpgScott Halasz | Greene County News Xenia police wait as a man crawls around a roof on Chinook Court Monday afternoon. The man was up there for several hours and refused to come down. He finally jumped down and fled before being apprehended by police.